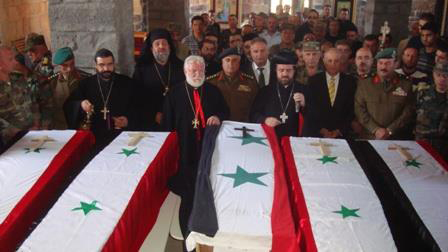 The “most serious and biggest massacre of Christians in Syria” in which 45 people were killed and 1,500 families held hostage has been reported by the Syrian Orthodox Metropolitan of Homs and Hama. It happened during the week following 21 October in the ancient Christian town of Sadad, which lies about 100 miles north-east of Damascus, after it was invaded by anti-Assad Islamist militias and before the Syrian army retook the town. Thirty more civilians were wounded and 10 are still missing. Around 1,500 families were held as hostages and human shields against the incoming government forces, and 2,500 others fled the town at gunpoint with only the clothes they were wearing. Church sources told the Catholic charity Aid to the Church in Need (ACN) that civilians unable to escape – including the elderly, disabled, women and children – were subjected to torture such as strangulation. Sadad lies between Damascus and Homs and is mentioned in the books of Numbers and Ezekiel in the Bible. Most of its population of 15,000 people are Syriac Orthodox and it is home to 14 churches, a monastery, temples, historic landmarks and archaeological sites. Most of these have been destroyed and looted, especially the Syriac Orthodox Church of St Theodore which the Wahhabi terrorists from al-Qaeda’s Jabhat al-Nusra (Nusra Front) used as a base. The archbishop said houses have been looted “and schools, government buildings, municipal buildings have been destroyed, along with the post office, the hospital and the clinic”. Lets pray for our brothers in Syria.